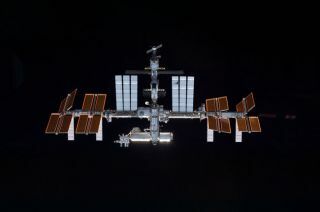 The International Space Station was nudged with the help ofa docked spaceship today (Oct. 26) to avoid a piece of space junk from adefunct NASA satellite that came uncomfortably close to the orbitinglaboratory. About three hours after the debrisavoidance maneuver, the fragment from what had been the Upper AtmosphereResearch Satellite passed 1.24 miles (2 km) from the space station, at 9:41a.m. EDT (1341 GMT). The maneuver came at a busy time for NASA and the spacestation, but agency officials said today's burn was not expected tosignificantly affect the upcoming launch and docking schedule of NASA's spaceshuttle and Russian Soyuz rockets at the space station. NASA spokesman Rob Navias said in a statement that themaneuver was not expected to affect the launchof space shuttle Discovery next week, or its arrival at the space station. Discoveryis scheduled to launch Nov. 1 and dock two days later to deliver a new storageroom, humanoid robot and supplies. By coincidence, Discovery had carried the Upper AtmosphereResearch Satellite into space Sept. 12, 1991. Although the satellite was designed to last about threeyears, the longevity of several instruments onboard resulted in a 14-yearmission of scientific research. The satellite was decommissioned in December2005. Russian flights of Soyuz spacecraft ferrying crews to andfrom the space station were similarly unaffected by the maneuver, Navias said. Russia's Federal Space Agency also plans to launch anunmanned Progress 40 cargo ship toward the station this week. It is due to arriveSaturday (Oct. 30). NASA typically moves the $100 billion space station if thereis a 1-in-10,000 chance of an object striking it. Mission Control works to keepa safety perimeter that extends 15 miles (25 km) around the space station, aswell as about a half-mile (0.75 km) above and below it. At last estimate, more than 19,000 pieces of spacetrash were in orbit, according to the Space Surveillance Network. Theseinclude items like spent rocket stages and broken satellites.Discovery is setto launch Nov. 1 from the Kennedy Space Center in Cape Canaveral, Fla., on itsfinal spaceflight to the space station. The 11-day STS-133 mission will betaking critical spare parts to the ISS, including a window-less storage roomand a humanoid robot helper called Robonaut 2.